Far more than simple political commentary, The Last Innocent White Man in America is a passionate marriage of politics and literature that transcends the daily headlines to get at how we imagine ourselves in history. 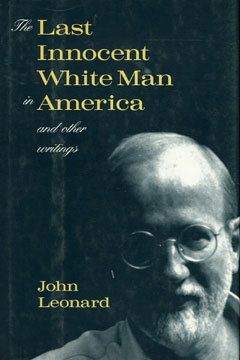 John Leonard is an unrepentant liberal, dissident, scourge, and media critic par excellence. Whether he's writing about bankers or AIDS, Congress or television, Salman Rushdie or Ed Koch, Leonard will make you stop, think, and laugh.